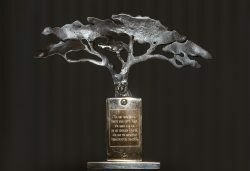 On July 21, 2018 Operndorf Afrika received the Karlheinz Böhm Award, granted by the foundation Menschen für Menschen. Karlheinz Böhm Preis, awarded for the second time, is devoted to the actor Karlheinz Böhm. In 1981, Böhm bet in the german television show Wetten, dass…? that “not even each third viewer would give one German mark, one Suisse franc or seven Austrian schillings to help the people in the Sahel region.” The actor collected about 8,4 million schillings that could form the basic stock for the organisation Menschen für Menschen – Karlheinz Böhms Äthiopienhilfe. Böhm’s motto “aid for self-development” reflects the sustainable work which focuses on the population’s concrete needs. The long-term projects in the areas agriculture, water, education, health and income aim to empower local people to promote their and the region’s development. This fulfils Böhm’s wish “one day not to be needed anymore”. Menschen für Menschen projects are realised in close cooperation with the population and regional authorities. After completion of the project, its responsibility is transferred to the local administrations. Out of 20 project regions in Ethiopia, in already nine regions the population could take over the full responsibility. The Karlheinz Böhm Award honours individuals and organisations for their sustained commitment in Africa. The award was given to Böhm’s friend and former Federal President of Germany Horst Köhler in 2016 for the first time. Köhler is likewise the Operndorf Afrika’s patron. Please find the greetings from the former Federal President of Germany Horst Köhler here! Get a visual impression of the event here! In 2016, the Operndorf Afrika was nominated as one of the Frieze Projects. Within the framework of Frieze London, one of the leading art fairs in the world, the project was made accessible to the public through an installation presentation. Frieze Projects – the innovative, non-profit program of the artists’ commission of Frieze London – was established in 2003. From 2016 – 2018 the program will be curated by Raphael Gygax (Curator Migros Museum Zurich). Since 1997, the Prince Claus Award is awarded annually by the Netherlands “Prince Claus Foundation for Culture and Development. It honours people and organisations, who have distinguished themselves particularly in contemporary culture. A main prize endowed with 100,000 Euro is awarded. In addition, up to 10 additional laureates receive prizes with prize money of 25,000 Euro each. The Operndorf Afrika has been nominated by the Curator Board, for the Prince Claus Award, in 2015. 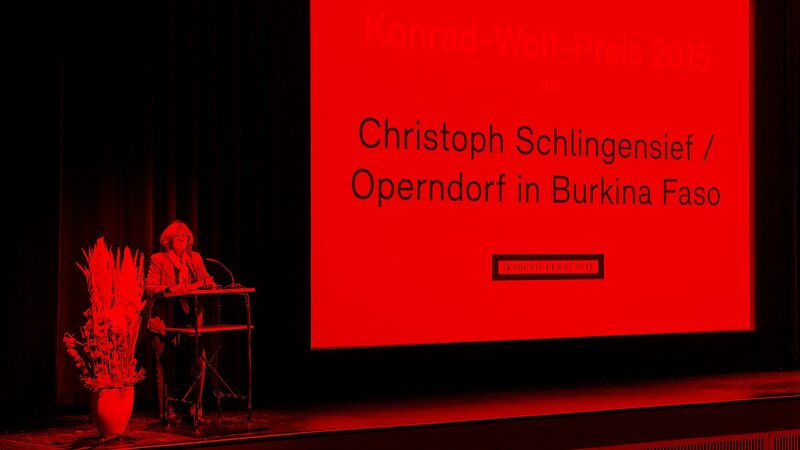 The Academy of Arts, Berlin awarded the Konrad Wolf Prize 2015 posthumously to Christoph Schlingensief and to the Operndorf Afrika, which he founded in Burkina Faso. The award of the prize, which is endowed with 5,000 Euro, took place at the Academy of Arts, on 20 October 2015, at 20 hrs. Following the award ceremony, the film “Crackling of Time – Christoph Schlingensief and his Operndorf Afrika in Burkina Faso by Sibylle Dahrendorf”, was shown. You can find the complete laudatory speech by Georg Seeßlen here. The 3sat prize of the theatre festival Theatertreffen Berlin is awarded for “outstanding artistic contribution” from the circle of the productions invited to the theatre festival Theatertreffen Berlin. In 2010, the prize was posthumously awarded to Christoph Schlingensief for his production VIA INTOLLERANZA II, a production of the Festspielhaus Afrika gemeinnützige GmbH. The jury as such not only paid tribute to an outstanding work from the ten productions invited to the theatre festival Theatertreffen Berlin, but also to Christoph Schlingensief, a personality who, for decades, was the driving force behind national and international performance culture and whose further works continue to have an effect, also beyond his untimely death. The 3sat prize endowed with 10,000 Euro was presented by the 3sat coordinator Daniel Fiedler to Aino Laberenz for the Operndorf Afrika, at the festival house Haus der Berliner Festspiele, on Saturday, 21 May, within the framework of the event “Culture as a Development Engine? The transformative power of cultural initiatives in Africa”: “The fact that in his last years of life he discovered the theme ‘Africa’ in his own way for himself and for us, also characterises him as a great visionary. Art was always a food for Christoph Schlingensief. 3sat has intensively accompanied his work right from the very beginning. I am delighted that we can help to continue this work with the award of the 3sat prize”, said Daniel Fiedler. The jury of the 3sat prize consisted of Iris Laufenberg (Head of the theatre festival Theatertreffen Berlin), Franz Wille (A member of the jury of the theatre festival Theatertreffen Berlin) and Wolfgang Bergmann (Head of the program group Theatre of the German public-service television broadcaster, ZDF).